After the betrayal and defeat of the Nawab of Bengal, Siraj ud-daulah, at the Battle of Plassey in 1757, the British installed their own puppet, Mir Jafar, as Nawab. The British extracted huge concessions from the defeated Bengalis including land, a monopoly of trade with Europe, and exemption from taxation on internal trade. The British subsequently replaced Mir Jafar with Mir Kasim as Nawab of Bengal. The Bengalis under Mir Kasim were finally driven to revolt when he was in turn sacked by the British and replaced by Mir Jafar for a second term. The Bengalis were defeated at the Battle of Buxar in 1764, and in 1765 the Moghul Emperor Shah Alam was “persuaded” to grant the power of taxation (diwani) in Bengal to the British East India Company. The British in turn sub-contracted rapacious revenue collection to Bengalis. Professor Utsa Patnaik’s estimate of Britain’s theft from India amounting to $45 trillion (1765-1938)(3)–(5) can be compared with estimates based on GDP considerations. According to Wikipedia, India’s share of the world economy declined from 24.4% in 1700 to 4.2% in 1950. India’s share of global industrial output declined from 25% in 1750 to 2% in 1900. (9) From available data on India’s GDP and India’s share of world GDP since 1700(10), (1) one can get a very rough estimate of what India’s cumulative GDP could have been from 1700-2003 if the British had not robbed and raped India. Thus the cumulative GDP (PPP) for India is given below for 6 periods since 1700 (A) at the observed average % of world GDP, and (B) if the average Indian % of world GDP had remained at the pre-British invasion 24.0% in 1770. Imposed poverty kills. Poverty-derived avoidable mortality (avoidable death, excess mortality, excess death, premature death, untimely death, death that should not have happened) can be estimated as the difference between the actual deaths in a country and the deaths expected for a peaceful, decently governed country with same demographics (birth rate and percentage of children). (12) Below are listed in rough chronological order some shocking salient features of the deadly impact of rapacious British imperialism over 2 centuries in British India, Britain’s Auschwitz. In the 1769-1770 Great Bengal Famine 10 million out of 30 million over-taxed Bengalis starved to death(6), (13). According to Professor Utsa Patnaik Indian per capita annual consumption of food was 200 kg in 1900, but went down to 137 kg during World War II and in 1946. (28) This is consonant with the following data from my book “Jane Austen and the Black Hole of British History”: “The population of India at that time  was about 400 million and total grain production was 50 to 70 million tons annually. The population was growing at a rate of about 5% per year and there was a requirement of net imports of about 1-2 million tons of grain per annum to make up for deficiencies… Behrens’ figures for grain shipments (in tons) for India in 1942-1945 are as follows: 1942 (30,000), 1943 (303,000), 1944 (639,000) and 1945 (871,000). The 1942 shipment involved 2 lots from Australia contracted for at the rate of 15,000 tons per month to supply the Indian Army (the balance of the demand was not shipped that year). 2.4 million men served in the Indian Army during World War 2. This estimate can be “reduced” since not all of these were in the Army at the same time, scores of thousands were in the Mediterranean theatre (250,000 served there), had been captured by the Japanese or had died. Taking the gross Indian annual grain production estimates of about 60 million tons for 400 million people, we see that the average consumption was 0.15 tons per person per year (obviously more for adults and less for children). The annual requirement for about 2 million men in the “reduced” Indian Army was therefore 0.3 million tons. We can arrive at a figure having a similar order of magnitude from the 1942 contracted requirement of 15,000 tons per month i.e. 0.18 million tons for a whole year. If we assume that an Indian Army soldier required 50% more food than the average Indian we would estimate that the annual grain requirement for a 2 million strong Indian Army would be about 0.45 million tons. The average yearly importation in 1942-1945 was 0.46 million tons and thus we can see that the grain actually imported was merely enough to feed the Indian Army” (pages 156-158, Chapter 15 (6)). Shashi Tharoor in “Inglorious Empire”: “The British left a society with 16 per cent literacy, a life expectancy of 27, practically no domestic industry and over 90 per cent living below what today we would call the poverty line” ((7), page 215 (8)). As indicated in (6) above, the life expectancy of 27 years corresponded to about 10 million Indian avoidable deaths from deprivation per year. The 3 Laws of Thermodynamics that underlie Chemistry, Physics and industry are (1) the energy of a closed system is constant, (2) the entropy (disorder, lack of information content) strives to a maximum, and (3) there is zero molecular motion in a pure crystal at absolute zero degrees Kelvin (-273. 15 degrees Centigrade). Polya’s 3 Laws of Economics are based on the 3 Laws of Thermodynamics and posit that (1) Price (P) – Cost of Production (COP) = Profit (p), (2) deception about COP strives to a maximum, and (3) No work, price or profit on a dead planet. (29) The major cost of production (COP) in the British Raj was the passive mass murder of 1.8 billion Indians through deadly impoverishment, and in keeping with Polya’s Second Law of Economics, the British strove to deceive the world about this horror. The capitalist perpetrator deception continues in a neoliberal One Percenter-dominated world that is existentially threatened by nuclear weapons (a nuclear winter from nuclear war would wipe out most of Humanity and the Biosphere), poverty (15 million people die avoidably from deprivation each year, 4 million in India) and man-made climate change (about 1 million people die from climate change each year but this set to increase to an average of 100 million deaths per year this century if urgent, requisite action is not taken). (30), (32) Poverty kills. History ignored yields history repeated. (6) Peace is the only way but silence kills and silence is complicity. Please inform everyone you can. ↩ Utsa Patnaik and Prabhat Patnaik, “A Theory of Imperialism”, Columbia University Press, New York, 2016. ↩ “Utsa Patnaik”, Wikipedia: en.wikipedia.org. ↩ Utsa Patnaik in Arindam Banerjee and C. P. Chandrasekhar, editors, “Dispossession, Deprivation, and Development. Essays for Utsa Patnaik, Columbia University Press, 2018. ↩ “How much money did Britain take away from India? About $45 trillion in 173 years, says top economist”, Business Today, 19 November 2018: www.businesstoday.in. ↩ Jason Hickel, “How Britain stole $45 trillion from India and lied about it”, Al Jazeera, 18 December 2018: www.aljazeera.com. ↩ Gideon Polya, “Jane Austen and the Black Hole of British History. Colonial rapacity, holocaust denial and the crisis in biological sustainability”, G.M. Polya, Melbourne, 1998, 2008 that is now available for free perusal on the web: janeaustenand.blogspot.com. ↩ Gideon Polya, “Review: “Inglorious Empire. What the British did to India” by Shashi Tharoor”, Countercurrents, 8 September 2017: countercurrents.org. ↩ Shashi Tharoor, “Inglorious Empire. What the British did to India”, Scribe, 2017. ↩ “Economic history of India”, Wikipedia: en.wikipedia.org. ↩ “Angus Maddison statistics of the ten largest economies by GDP (PPP)”, Wikipedia: en.wikipedia.org. ↩ Angus Maddison, “Contours of the World Economy 1-2030AD”, Oxford University Press, 2007. ↩ “Gideon Polya, “Body Count. Global avoidable mortality since 1950”, including an avoidable mortality-related history of every country from Neolithic times and is now available for free perusal on the web: globalbodycount.blogspot.com. ↩ Paul Greenough (1982),“Prosperity and Misery in Modern Bengal: the Famine of 1943-1944” (Oxford University Press, 1982). ↩ Gideon Polya, “Economist Mahima Khanna, Cambridge Stevenson Prize And Dire Indian Poverty”, Countercurrents, 20 November, 2011: countercurrents.org. ↩ Amaresh Misra, “War of Civilisations: India AD 1857”. ↩ Randeep Ramesh, “India’s secret history: A holocaust, one where millions disappeared”, Guardian, 24 August 2007: www.theguardian.com. ↩ Populstat, “India. Historical demographical data of the whole country”: www.populstat.info. ↩ Winston Churchill, speech to the House of Commons about Indians (1935); 1. Hansard of the House of Commons, Winston Churchill speech, Hansard Vol. 302, cols. 1920-21, 1935. ↩ N. G. Jog, “Churchill’s Blind-Spot: India”, New Book Company, Bombay, 1944 (Winston Churchill quoted on p195). ↩ K.C. Ghosh, “Famines in Bengal 1770-1943” (National Council of Education, Calcutta, 2nd edition 1987). ↩ T. Das, T. (1949), “Bengal Famine (1943) as Revealed in a Survey of Destitutes of Calcutta”, University of Calcutta, Calcutta, 1949. 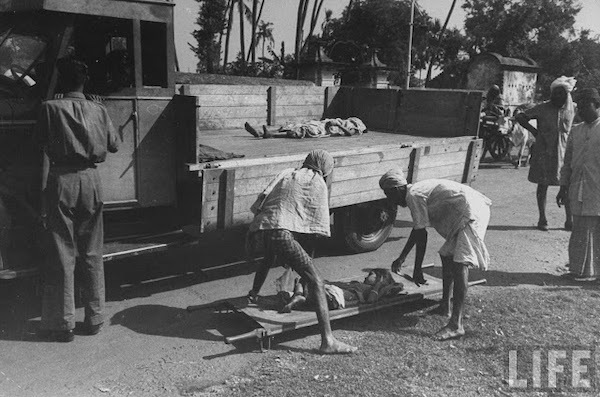 ↩ Gideon Polya, “Australia And Britain Killed 6-7 Million Indians In WW2 Bengal Famine”, Countercurrents, 29 September, 2011: countercurrents.org. ↩ “Bengali Holocaust (WW2 Bengal Famine) writings of Gideon Polya”, Gideon Polya: sites.google.com. ↩ Amartya Sen, “Famine Mortality: A Study of the Bengal Famine of 1943” in Hobshawn, E. (1981) (editor), Peasants In History. Essays in Honour of David Thorner (Oxford University Press, New Delhi). ↩ Cormac O Grada (2009) “Famine a short history” (Princeton University Press, 2009). ↩ Madhusree Muckerjee (2010), “Churchill’s Secret War. The British Empire and the ravaging of India during World War II” (Basic Books, New York, 2010). ↩ Thomas Keneally (2011), “Three Famines” (Vintage House, Australia, 2011). ↩ Prianshi Mathur, “Did you know that back in the Raj days, British looted Rs 3.2 lakh crore from India?”, India Times, 16 December 2018: www.indiatimes.com. ↩ Gideon Polya, “Polya’s 3 Laws Of Economics Expose Deadly, Dishonest And Terminal Neoliberal Capitalism”, Countercurrents, 17 October, 2015: countercurrents.org. ↩ “Too late to avoid global warming catastrophe”: sites.google.com. ↩ “Nuclear weapons ban, end poverty & reverse climate change”: sites.google.com. Dr Gideon Polya taught science students at a major Australian university for 4 decades. He published some 130 works in a 5 decade scientific career, most recently a huge pharmacological reference text “Biochemical Targets of Plant Bioactive Compounds” (CRC Press/Taylor & Francis, New York & London , 2003). He has published “Body Count. Global avoidable mortality since 1950” (G.M. Polya, Melbourne, 2007: globalbodycount.blogspot.com); see also his contributions “Australian complicity in Iraq mass mortality” in “Lies, Deep Fries & Statistics” (edited by Robyn Williams, ABC Books, Sydney, 2007: www.abc.net.au) and “Ongoing Palestinian Genocide” in “The Plight of the Palestinians (edited by William Cook, Palgrave Macmillan, London, 2010: mwcnews.net). He has published a revised and updated 2008 version of his 1998 book “Jane Austen and the Black Hole of British History” (see: janeaustenand.blogspot.com) as biofuel-, globalization- and climate-driven global food price increases threaten a greater famine catastrophe than the man-made famine in British-ruled India that killed 6-7 million Indians in the “forgotten” World War 2 Bengal Famine (see recent BBC broadcast involving Dr Polya, Economics Nobel Laureate Professor Amartya Sen and others: www.open.edu; Gideon Polya: sites.google.com; Gideon Polya Writing: sites.google.com; Gideon Polya, Wikipedia: en.wikipedia.org). When words fail one can say it in pictures–for images of Gideon Polya’s huge paintings for the Planet, Peace, Mother and Child see: sites.google.com and www.flickr.com.